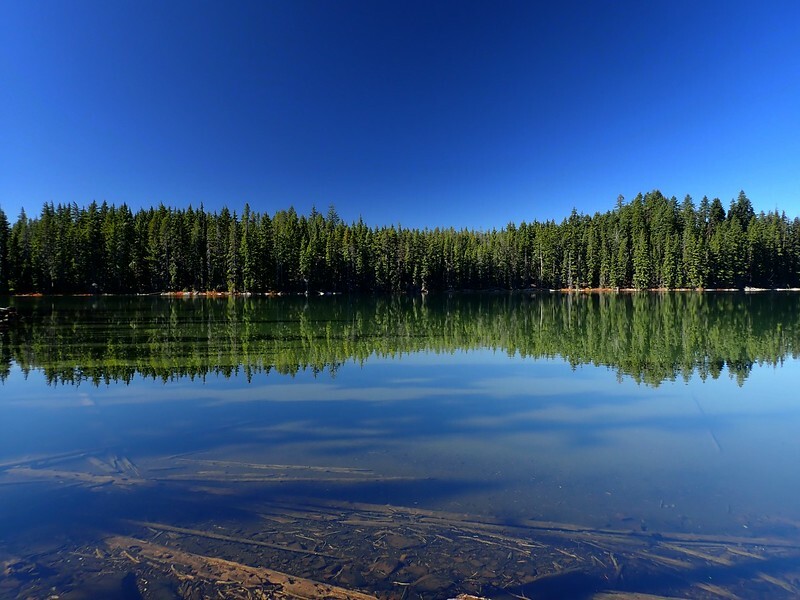 The Sky Lakes Wilderness stretches north to south along the Cascade Crest between Crater Lake National Park in the north and State Highway 140 in the south. Three major lake basins (Seven Lakes, Sky Lakes, and Blue Canyon) occupy this wilderness and we’ve so far hiked in all of them. 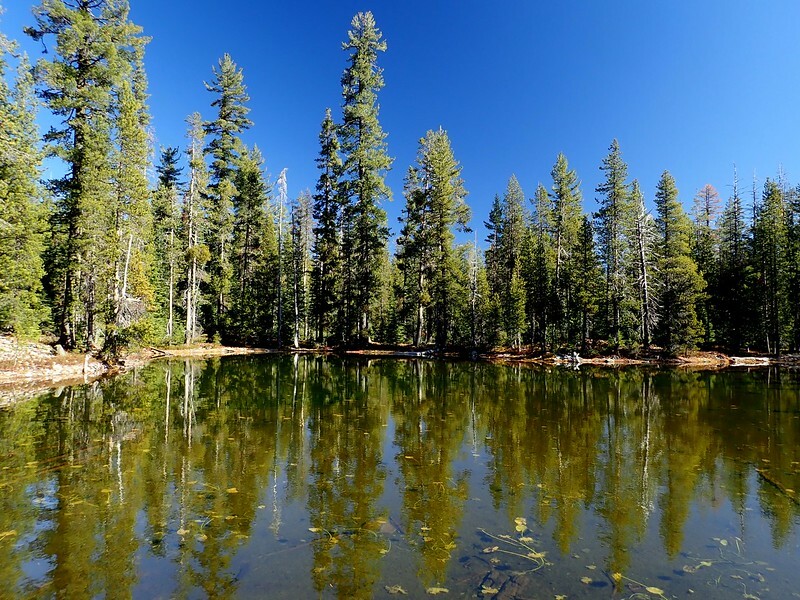 But the Dwarf Lakes Area, a subsidiary of the Sky Lakes Basin, had gone unvisited, and I’d planned a first visit for earlier this Fall. 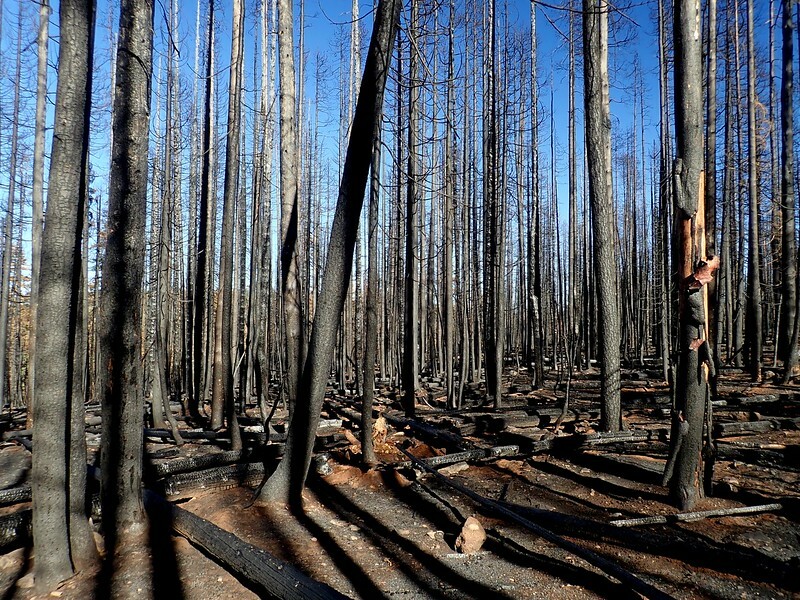 But then a host of wildfires (the High Cascades Complex) blew-up, keeping this wilderness closed until the end of September. One of the complex’s component fires, the North Pelican, had burned its way west off the slopes of Pelican Butte and into the southern end of the Sky Lakes Basin. 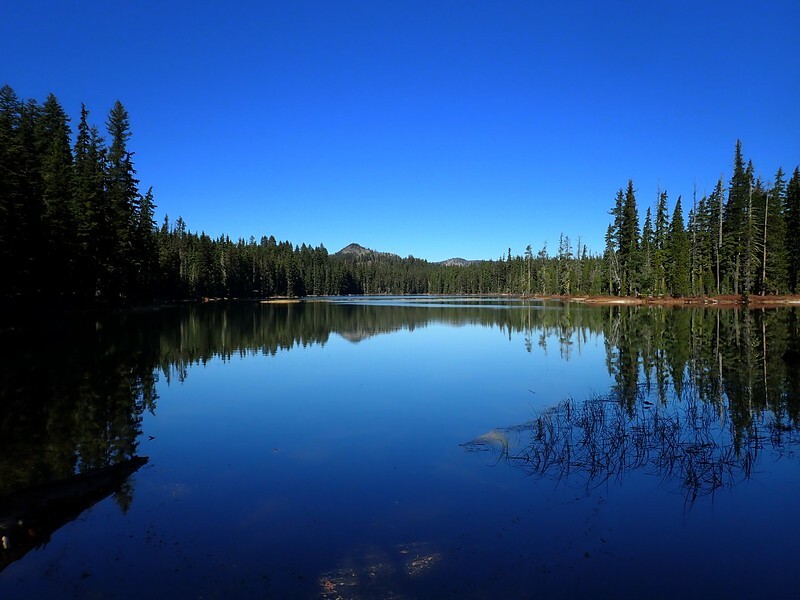 Then an early season blanket of snow put an end (mostly) to this reign of fire, opening the way for a late-in-the-season visit to the Dwarf Lakes. With the LovedOne busy at the library, I approached this hike solo with a lot of trepidation about what I would find the North Pelican had done to this basin. 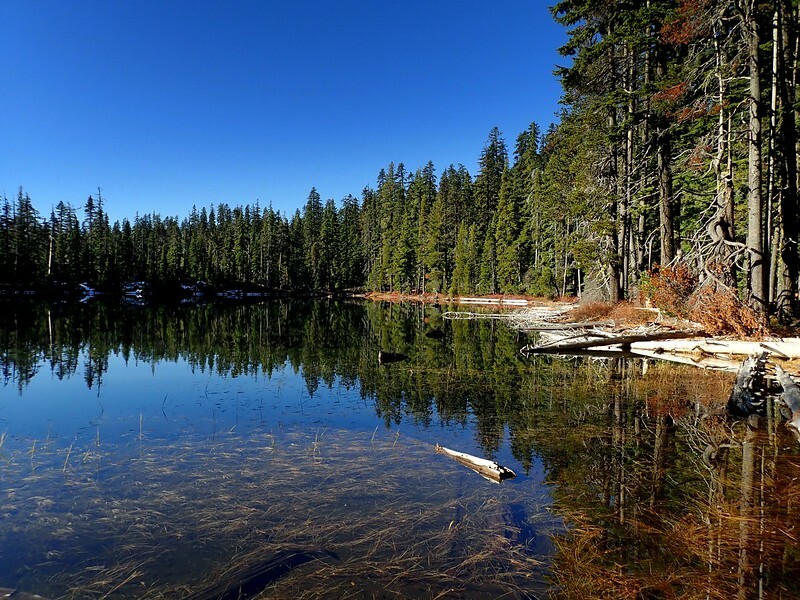 The quickest access to the Sky Lakes Basin is from the Cold Springs Trailhead. Wildfire crews had been able to save the historic shelter, its associated spring (still running! ), and the sole amenity (a pit toilet) at this trailhead. As part of the after-fire activities, they also reconditioned Forest Road 3651 and tidied-up the parking area. The trees around the parking area were unburned and green and, if you only came this far, you might think there hadn’t been much of a fire. But I hadn’t gone even 100 yards north on the Cold Springs Trail (USFS #3710) before the effects of the fire started showing themselves. 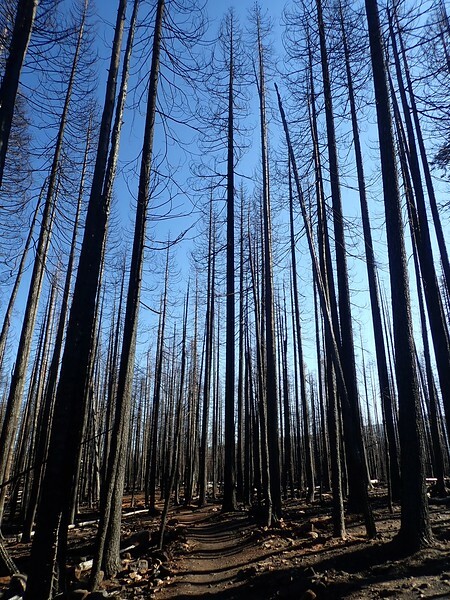 The devastation grew and grew as I went north, where the fire had jumped from the ground to engulf the entire forest canopy. I found a new sign at the wilderness boundary. The previous sign had been completely incinerated – evidence of its existence marked only by three nails spiked into a tree behind the new sign. 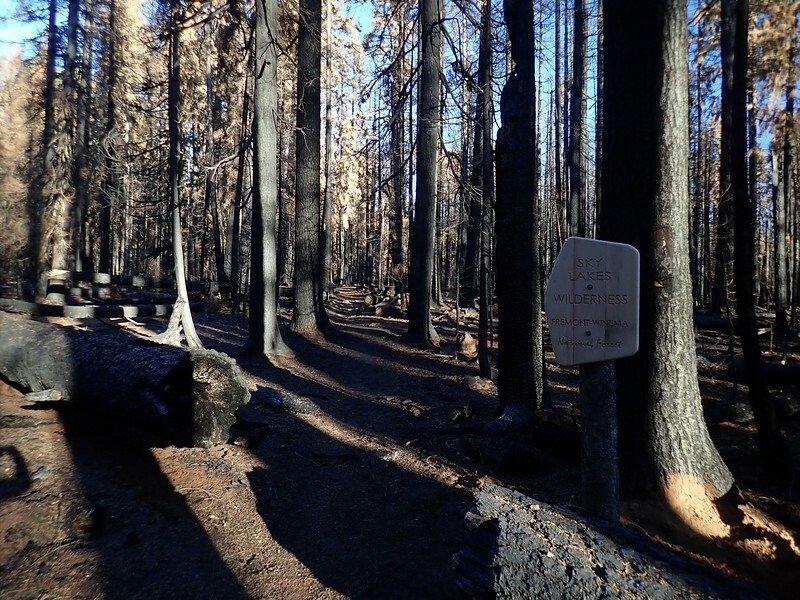 Shortly after crossing the boundary – and still in a heavily burned forest – I came to the junction with the South Rock Creek Trail (USFS #3709) but continued northwest on the Cold Springs Trail, through yet more fried forest. 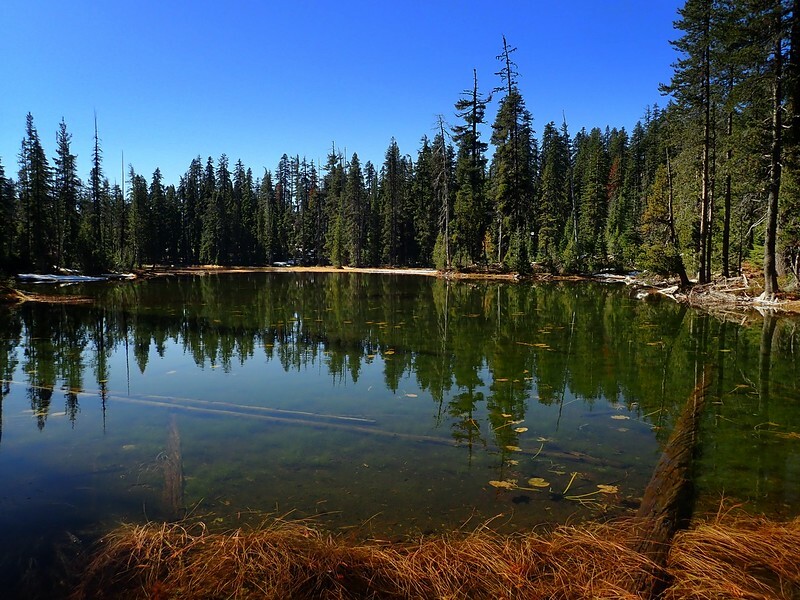 to its junction with the Pacific Crest Trail (PCT). 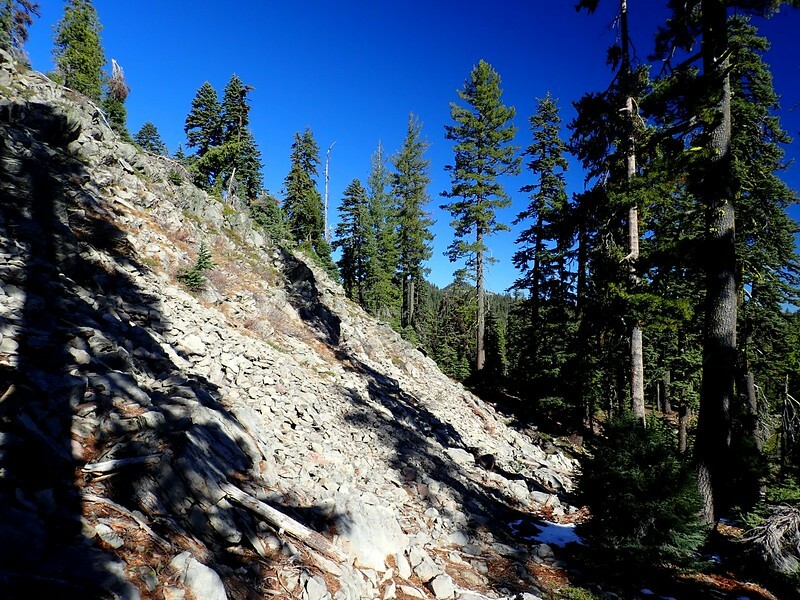 Here, I turned north on the PCT, which alternated between open dirt and patches of snow up to 18 inches deep, but was otherwise clear of obstructions. 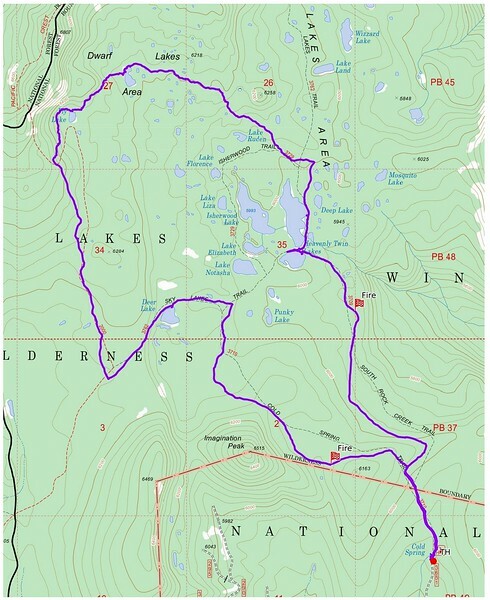 At 6,400 feet, I left the PCT and went a short ways northeast cross-country to Fly Lake (maps show the PCT coming close to Fly Lake but it no longer does). Fly isn’t the largest lake in this area but it’s the only named one – for some reason the largest lake didn’t get a name. 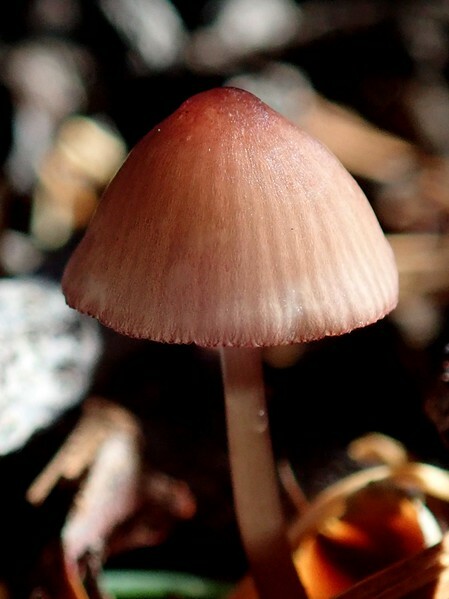 We’re past flowers now but 1 centimeter high mushrooms are still trying for one more sporulation before being buried by the snows of winter. 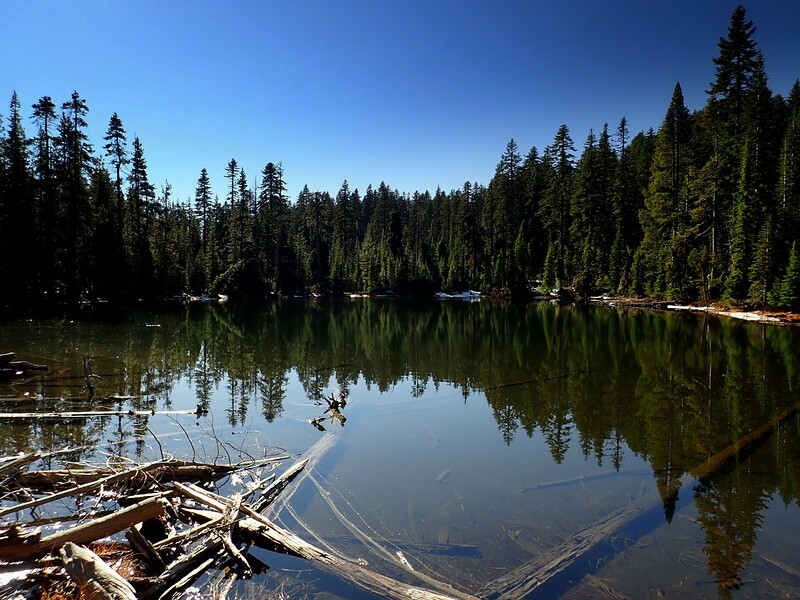 This is true wilderness: untracked, littered with fallen trees, rocky outcrops, boggy patches, and short ridges. The snow was just enough to cover yawning gaps between fallen trees and rocks, but not firm enough to actually bridge these potential ankle breakers. 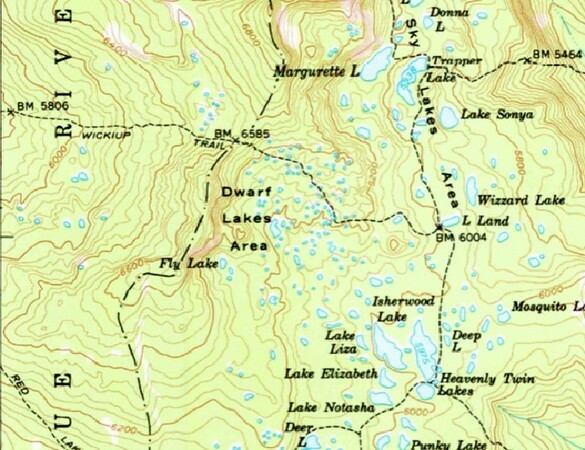 So, not hard travel but I had to watch my footing at all times as I left Fry and headed toward what the map indicated was the largest water body in the Dwarf Lakes Area. 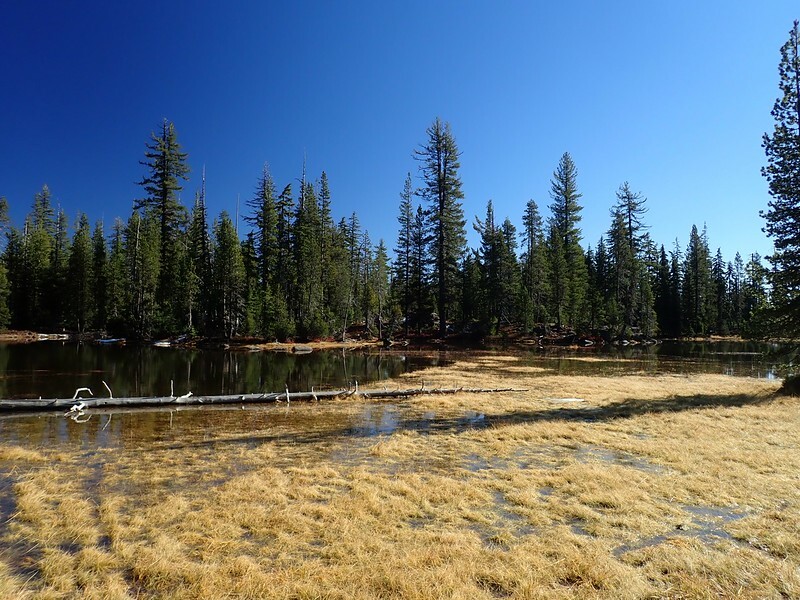 After more wandering in the wilderness, I arrived at the largest lake (informally “Dwarf Lake”) to find it expansive, but shallow, and about half meadow this late in the season. From “Dwarf Lake” I continued my wilderness wanderings south-southeast to intersect the Sky Lakes Trail just north of its intersection with the Isherwood Trail (USFS #3729). 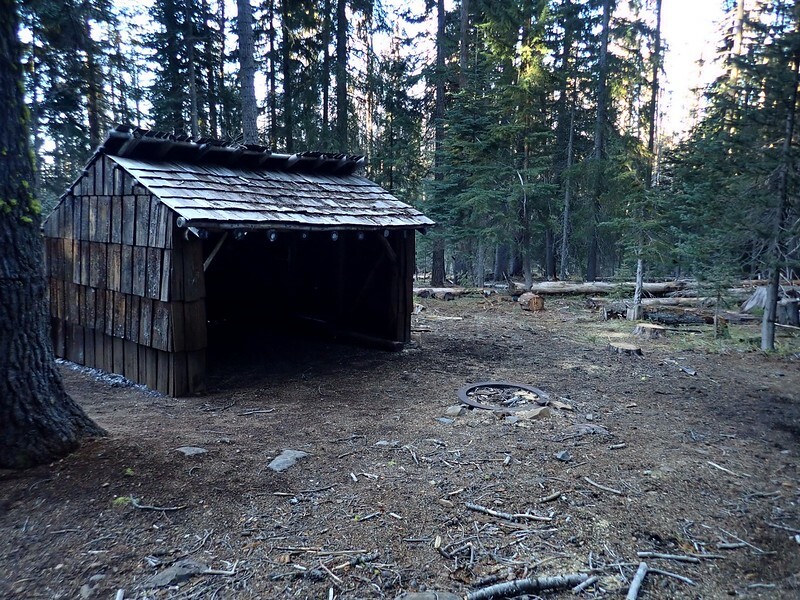 My track took me near the alignment of the now abandoned Wickiup Trail (formerly #986 on the Rogue-Siskiyou National Forest; #3728 on the Fremont-Winema National Forest), which used to cross the crest to connect Lake Land with Wickiup Meadow. It was first mapped in 1955 and was mentioned in PCT guidebooks as late as 2007. 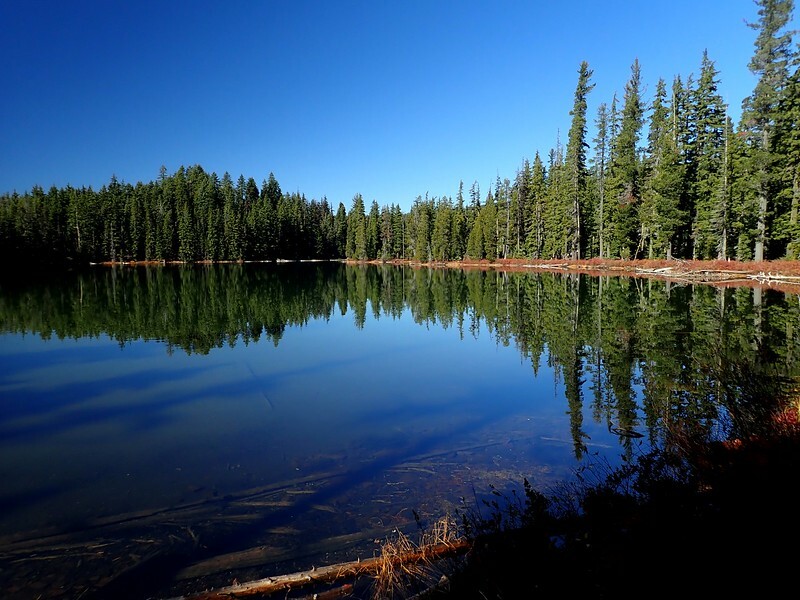 The junction of the Sky Lakes and Isherwood Trails (which is not where it’s shown on the USGS and USFS maps) is at the north end of the northern most of the Heavenly Twin Lakes. This lake escaped the fire and was beautiful on this Fall day. Continuing south on the Sky Lakes Trail, I came to the divide between the two Heavenly Twin Lakes and the junction with the South Rock Creek Trail. The fire had burned the south side of the smaller of the two Heavenly Twins but spared this area. 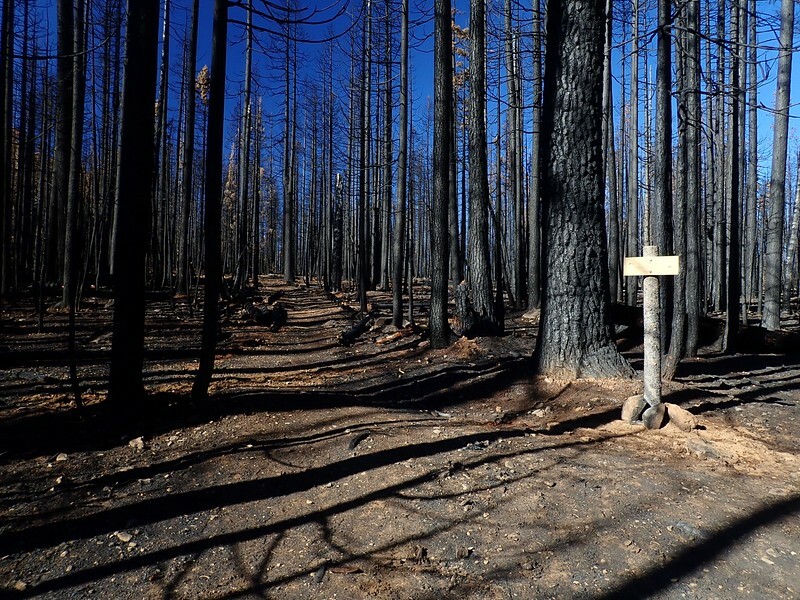 I went south on the South Rock Creek Trail and soon realized that the forest surrounding it had taken the brunt of the fire damage. 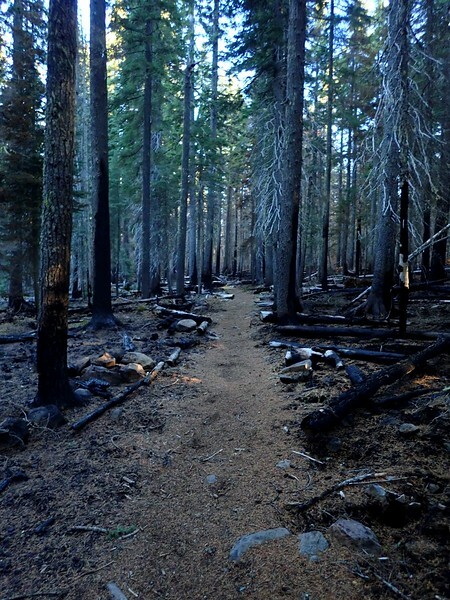 The trail itself was in fine condition, obviously having received some post-fire repairs. But the forest was black sticks and burnt umber crowns – and the trail was covered with a golden dusting of heat-shocked needles. 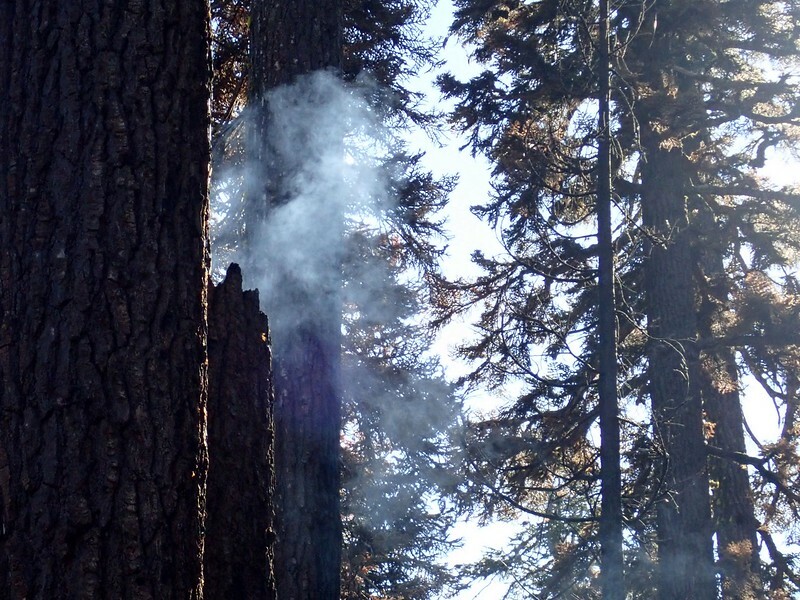 At one point, I saw smoke rising from a tree and realized that the fire isn’t totally over yet – it’s going to take a full-on winter to finally drive a stake through its black heart. 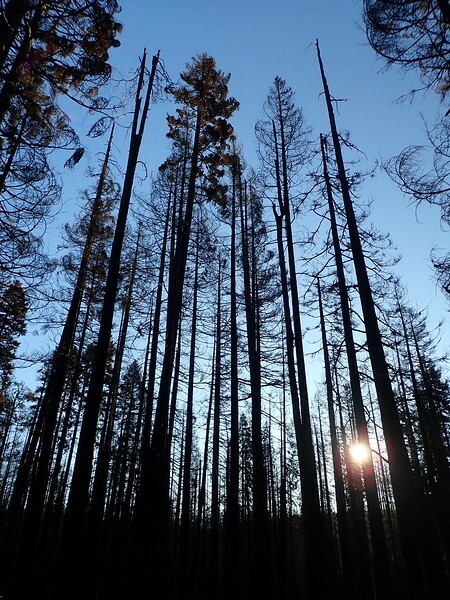 I also came across a fallen tree that, from the outside looked fine – unburned bark, green crown – but which had been completely hollowed out by fire. I also saw where otherwise unburned trees had fallen because the fire had damaged just the base of the trunk and/or the roots. 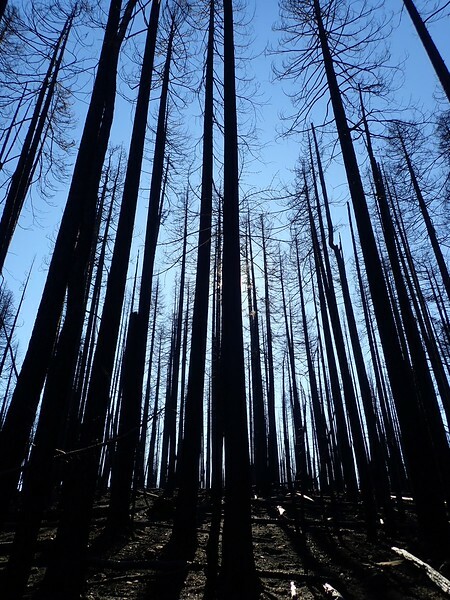 In Idaho, we had seen whole Ponderosa pines felled by fires that never got taller than the grass in which they were burning. 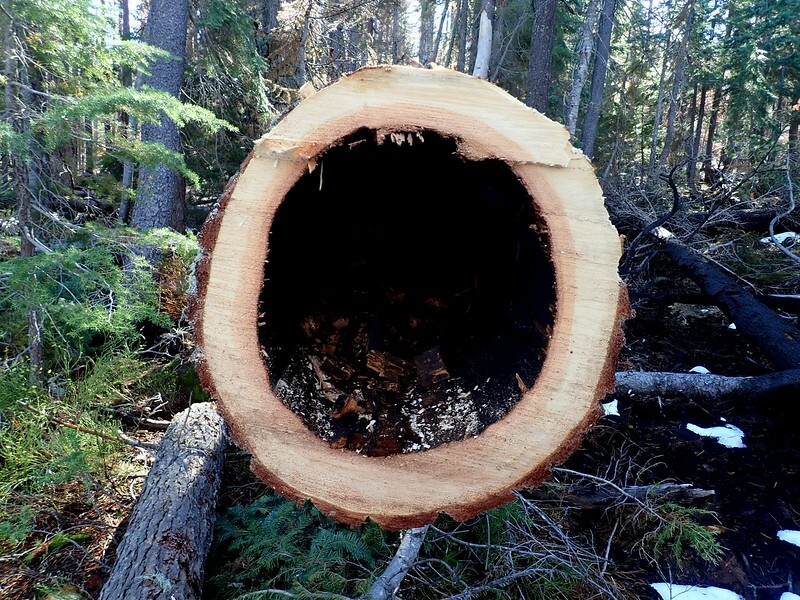 This kind of “stealth burning” makes for trees that are eligible to fall on you without warning. 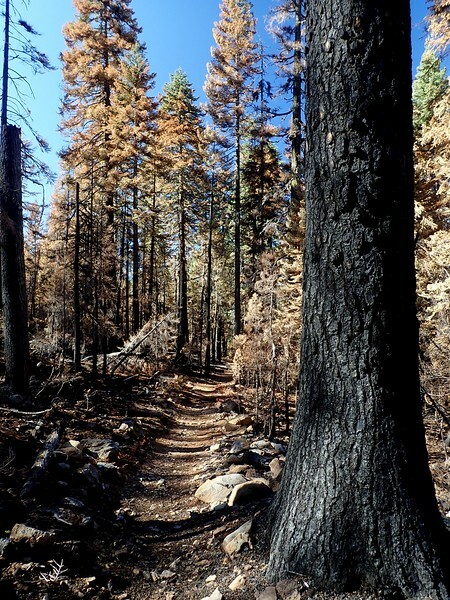 Be vigilent if you hike these burned trails! The rest of the way back on the South Rock Creek Trail was a trail of tears for a forest gone but very fondly remembered. I hit the “sweet spot” (if you can call it that) for fire damage along the Cold Springs and South Rock Creek Trails. 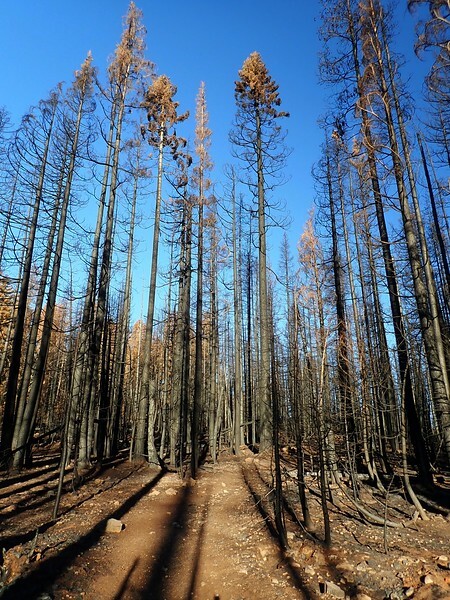 The burned and dead trees haven’t started falling yet (but they will) and the trail was in good condition thanks to some post-fire clean-up. 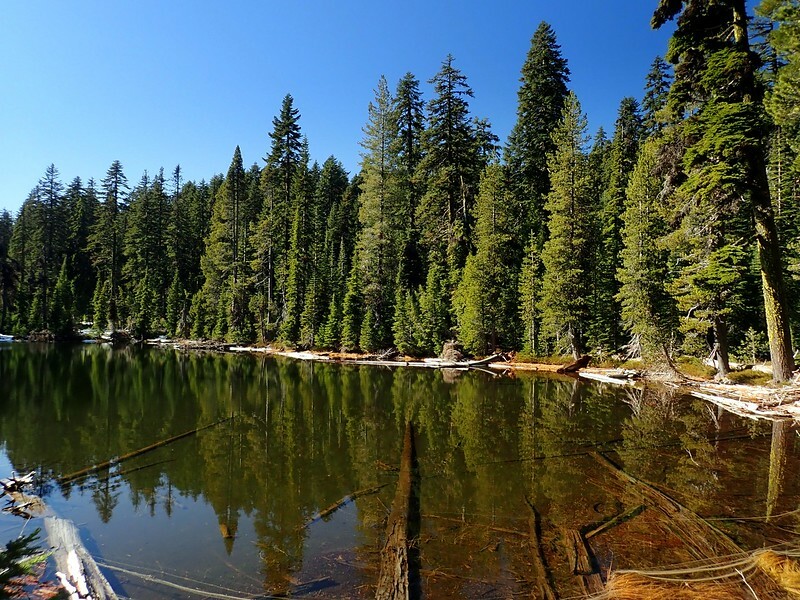 But in the years ahead, these trees will fall, adding to the maintenance burden on what is one of the most popular entry points to the Sky Lakes Wilderness. One hopes that there’s a trail maintenance budget available when the time comes. Otherwise, a nice loop (10.6 miles; 1,000 feet of elevation gain) past some pretty lakes, with some frisson provided by cross-country wilderness travel.